Once the winter snow disappears, the renewed Colorado landscape unveils a statewide network of mountain-bike trails. Bike racks quickly replace ski racks and bikers of all experience levels enjoy amazing rides that span red-rock shelves and creekside tracks to high mountain passes and aspen-lined loops. Find your perfect ride below. Boreas is a great family ride that starts out on a wide road — formerly an abandoned narrow-gauge rail bed — and splits off into forested singletrack that twists past historic mining relics. The trail fits the bill for an afternoon or early evening ride for those seeking a quick adventure with stunning mountainside views. The Pineridge Natural Area is within pedaling distance of Fort Collins and offers gentle rolling hills and smooth trails for novice bikers wanting to get a feel for the sport. A web of trails ribbons past Dixon Reservoir, wetlands and high-grass prairie teeming with local wildlife. A local favorite, this trail starts near downtown Aspen, runs alongside Hunter Creek and opens up to a gorgeous wildflower meadow. The shaded path crosses several bridges and climbs more than 700 feet in the first mile along steep, rocky terrain before mellowing into rolling singletrack. Work up a sweat with this easily accessible ride west of Vail. Tight-turning singletrack jogs through thick woods before journeying into sloping sagebrush fields. Three sections start with short climbs followed by exciting descents down rolling trails for a fun mix of ups and downs. Check out Eagle's photo trail-navigation feature to see nearly every inch of the ride. Often voted among the state’s top trails, Buffalo Creek’s secluded loop rests in the foothills southwest of Denver. The thrill of gravity attracts riders to the slickrock sections and hairpin turns that cruise by striking rock formations. Minimal work reaps maximum rewards as long, steady climbs lead to even longer stretches of downhill. Not for the faint of heart, Zippity-Doo-Da is as whimsical as its name suggests and offers intense swooping downhill and technical singletrack. 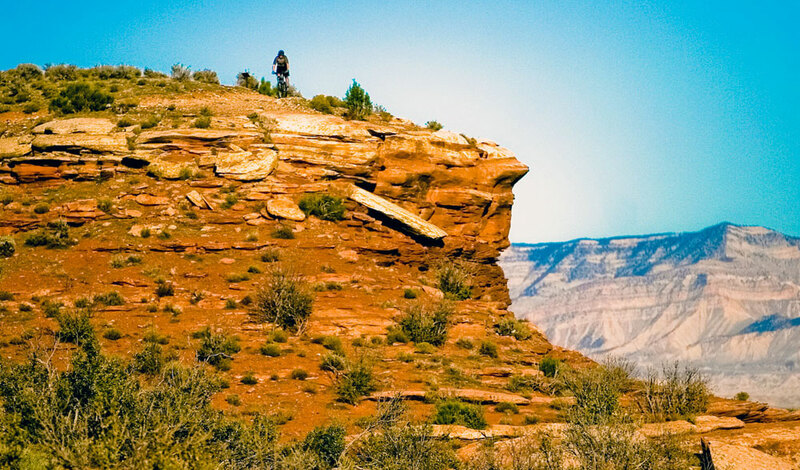 The trail rips through western Colorado’s desert landscape in an eight-mile loop, sweeping along steep ridges, over sheer edges and past the spectacular Bookcliffs rock formations. Endurance and a good set of lungs are key for this long-distance, high-altitude ride. The technical rider’s playground begins at the top of Monarch Pass and is loaded with boulders and trees along much of the trail. The tough climb tops out at about 11,960 feet and then drops riders onto exhilarating downhill through rock gardens and eventually over a streambed. The expert trail of all expert trails, this bucket-list ride climbs 7,500 vertical feet in under 13 miles to the top of Pikes Peak. The Barr Trail begins with a section of switchbacks called “the incline” and continues on a relentless climb to a rock arch and more steep switchbacks. Be prepared for fast-changing weather and colder conditions above treeline along with challenging loose pea gravel and large boulders. Find other things to do on Pikes Peak.